The 7th Annual Hunahpu’s Day® is Saturday, March 12, 2016. For the first time in its storied history, Hunahpu’s Day® will be held offsite away from our brewery, at Cotanchobee Fort Brooke Park in beautiful Downtown Tampa, Florida. A huge thanks to the City of Tampa and the Tampa Downtown Partnership for working with us on this! Many more details to follow. Stay tuned! Cigar City Hunahpu’s Day 2015 is ON, kiddos – tickets will drop for the general public on Monday, January 19 at 7pm EST. After the great Hunahpu’s fiasco of 2014, nearly everything has changed about the event, so check out all the details to prepare for what to expect from one of Tampa’s craziest craft beer gatherings. Cigar City Brewing is located at 3924 W Spruce St in Tampa, FL. The details are finally here! Tampa’s Cigar City Brewing Company has all of the information you need to know for the 2013 issue of Hunahpu’s Day, which sees the brewery increasing production (queue the collective sigh of relief) of this vanilla, chile and cinnamon infused imperial stout. The 4th Annual Hunahpu’s Day Release Party is set for Saturday, March 9th at Cigar City Brewing. This will also be the 2nd time Hunahpu’s Day has been featured for Tampa Bay Beer Week. Gates will open at 7:50am. Draft beer will start pouring at 9:00am. Breakfast will be made available when the gates open. There will be several food trucks on site throughout the day. The full list of food trucks and vendors will be available soon. There will be no parking at Cigar City Brewing on March 8th and 9th. Instead there is a lot across the street at 4005 W. Spruce Street. There will be signs indicating where to park. That means the Friday before Hunahpu’s Day there will be no parking at Cigar City. This will give us plenty of time to set-up and make sure everything goes as smooth as possible for Hunahpu’s Day. To receive your bottles of Hunahpu’s Imperial Stout, you will need to get a wristband at the entrance of the festival. You will be ID’d as well, and you will receive an additional wristband indicating you are 21+ years of age. The wristbands are ABSOLUTELY required for purchase of Hunahpu’s bottles and will be cut off of your wrist by an employee upon purchase. If you lose it we are very sorry but this is non-negotiable. Wristbands are handed out on a first-come-first-serve bases while supplies last, limited one per person. Bottles of Hunahpu’s Imperial Stout are 750mL (25.4 FL OZ), and will be sold for $20, CASH ONLY. Bottles will be sold at 3 locations in the lot. There will be a 3 bottle limit for the first 4,000 guests. They will receive a special wristband. The next 1,000 guests will be limited to 2 bottles and will receive a different wristband. You can only have one type of wristband. Bottle sales will start when the last wristband is given out, or at 12:00pm, whichever comes first. At 5:00pm, sales will open up to the general public with a limit of one case (12 bottles) per person. If you have a wristband, you are ONLY guaranteed your bottles until 5:00pm! We are going to sell special tokens for $5 a piece. These tokens will be good for ANY purchase on Hunahpu’s Day, excluding food trucks and non-affiliated vendors. This means you can use a $5 token to purchase any beer, bottle, merchandise, etc., of equal value, inside the tasting room and outside. So in essence, a $5 token is equivalent to a $5 bill. There will be several booths selling tokens scattered around the lot. There will be more draft beer stations available than last year. We’re going to feature many guest beers and plenty of special beers from us. A full draft list will probably not be available until the week of Hunahpu’s Day. Live music will start at 11:00am. There will be several bands throughout the day. A full list will be announced soon. One of Florida’s most popular craft breweries dropped their 2013 release calendar this week, setting up a schedule for 23 different beers to hit markets throughout the upcoming year. Cigar City Brewing Company will have a variety of canned six-packs, bottled four-packs and 750mL bottles available, along with a new additions to their growing resume. The Humidor Series IPA will hit four-packs, along with more canning of Jai Alai, Maduro, Hotter than Helles and Florida Cracker. 12 seasonal releases are also slated for release, including some old favorites (Marshal Zhukov’s and Guava Grove) and a few newer faces (Cucumber Saison and Humidor Series Imperial Stout). 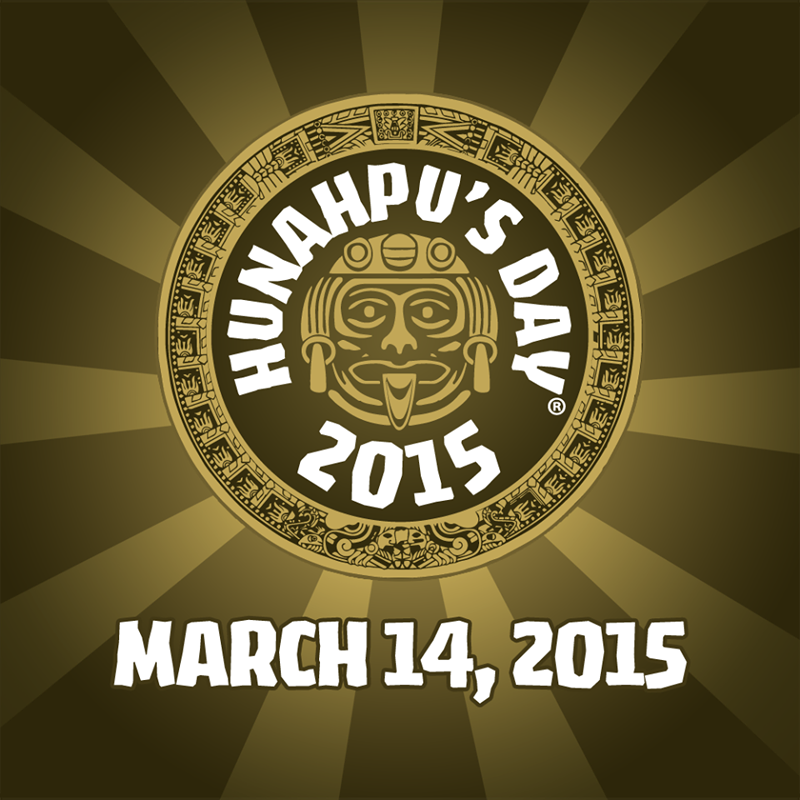 Oh, and by the way – Hunahpu’s Day is March 9, 2013. No other details yet.